For this week’s post I’m indebted to watercolour artist David Harmer. 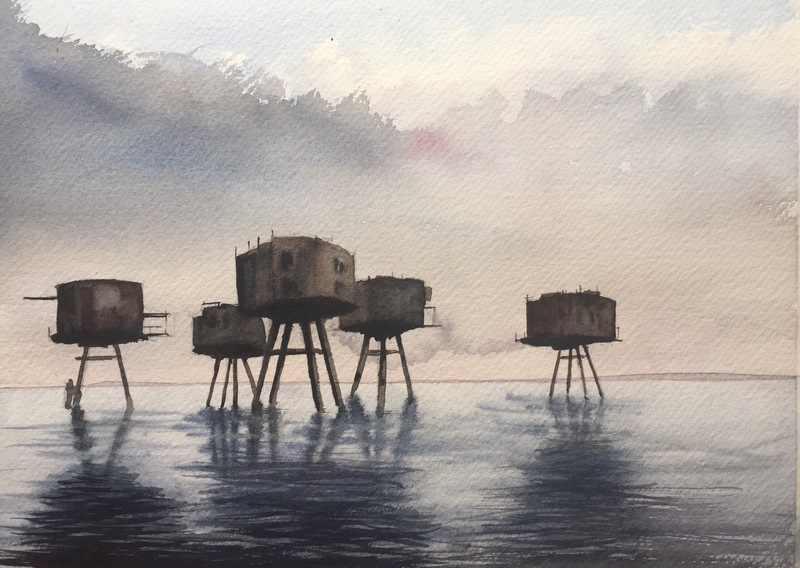 David was recently inspired to take on a most unlikely watercolour challenge – to paint the Maunsell Sea Forts, named after their designer Guy Maunsell, in the Thames Estuary. 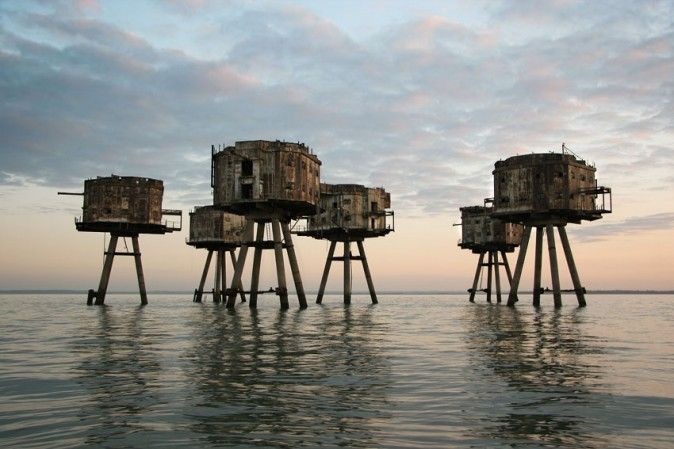 These amazing structures were built during the second world war with the primary aim of defending the country from air attack, especially by bombers that would use the Thames estuary as a means of navigation to reach London. Each fort comprised of seven structures that were linked by walkways. Built in harbours, they were sailed into place on concrete barges that were then sunk onto the sea bed. They are now derelict hulks, visual curiosities that remind us of the terrors of our not too distant history. After taking a boat trip out to see the forts, David took it upon himself to tackle this subject in watercolour. 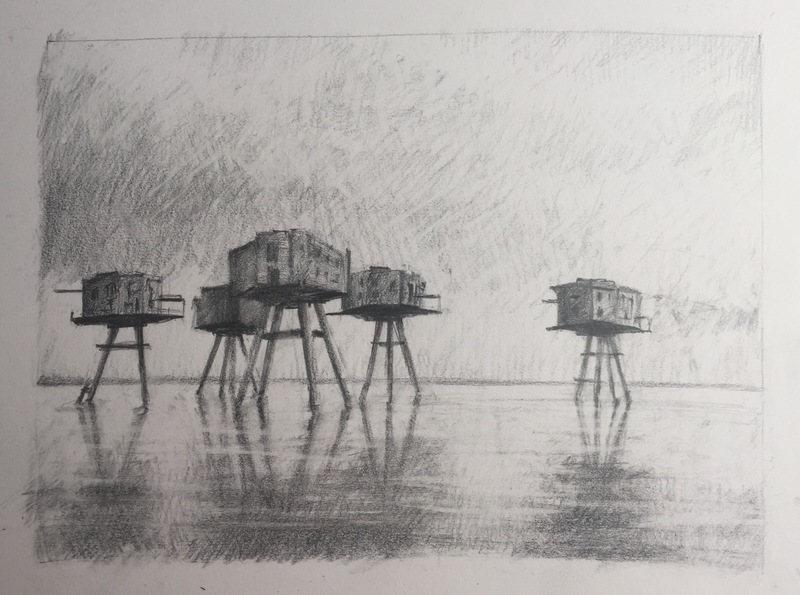 Almost a decade ago now, I used to live in the coastal town of Whitstable, where one of these sea forts was clearly visible from the shore, along with the more recent addition to the horizon of an off-shore wind farm. Like David, I had many years ago taken a boat trip out to get a closer look at these monolithic relics and learn a little more about them. Reading David’s blog brought these memories, and those of my time in Whitstable, flooding back to me and before I knew it, I was contemplating a companion piece to David’s work. I started my own journey with this after seeing David’s preliminary sketch. I was keen to portray some sense of the strange sense of majesty of this structures as they seemingly stride across the sea. Fortunately these are much photographed, so there’s plenty of reference material available. After much looking around, I decided to base my painting on the image below that I think portrays an almost romantic view of them. As I’m trying to do increasingly, I started with a little pencil study. These are proving really valuable as, whilst I’m sketching I’m looking more closely at the subject matter, understanding how it works, what are the most important elements and how I might achieve those colours / effects in watercolour. Surprisingly, I’m also enjoying the process of drawing, of adding then taking away (a tremendous novelty for a watercolour painter!) and I’m also pleasantly surprised with some of the results – not so much this one perhaps, but the thinking that went on as I was doing it proved invaluable. You’ll see that to the right of the painting, I only sketched in one of the structures as opposed to the two in the photograph. This just seemed to create a better composition, perhaps with a little more tension. And so to my painting. I approached this with a view to doing a Hilderesque layering of washes for the sky, and a more wet into wet treatment of the sea. I wasn’t too worried about the detail of the structures as it was more the majesty I was after rather than an exact representation. Sadly, I started this painting when surrounded by domestic distractions – this led to me taking my eye off the ball a little with the resulting cauliflowering along the horizon line which really annoyed me. When I reached the sea, I felt I was painting more in hope rather than with confidence in what I was doing. I was applying wash after was onto already damp paper. This, and repeatedly trying to lift off paint to indicate some movement on the surface of the water, gradually led to the painting becoming overworked. I did like the treatment of some of the forts, and thought that the virtual silhouettes of these structures with very little detail was what I was after. I didn’t completely dislike this painting, but I did think that I could do better. Learning from my first effort, I did the sky in two washes and feel that it’s much more satisfactory, with more depth and movement than the first version. I also tried to paint the sea in a lighter, and more confident manner. I did a graded wash, then whilst this was still damp, lifted out some of the large vertical areas of light that coming between the towers, and then left this to dry completely. I then added the dark ripples in the water, trying not to overdo this, and also trying not to go too dark.The sea forts themselves were left with relatively little detail aside from their overall shape. This second version was much closer to what I’d been hoping to achieve with this painting. I think this is largely to do with the sky which has a certain depth and grandeur to it. As however David acknowledges in his final post – this subject is unlikely to be much of a seller! I think as a technical challenge, it definitely served a purpose. And I think as a companion piece to David’s painting – the a distant view and a more close up view, and differing styles of painting, there’s a certain synergy. On that note, I’d like to thank David for leading me to tackle a watercolour challenge that I otherwise doubt I would have considered. I’ll leave you for now with a short aerial view video of one of the Maunsel sea forts that I think captures, a little more successfully than I managed with my painting, the majestic eeriness of these strange structures. This is the first post from John that I viewed on his blog. Great content and glad I found this blog on watercolor! Many thanks for reblogging Al, much appreciated and it’s great to have met you via the blogs! Loved this blog and can’t wait to read more. I must say though the second attempt was technically the better one I’m rather drawn to the first as I like the darker tone. I often visit abandoned buildings and I always say I’ll draw or even paint parts and never do. So I think I will next time. Some great ones up north. Cheers and no worries worth the read lad. Thanks Daniel – afraid I’m a converted Southerner that doesn’t get up north as much as I’d like! Thanks so much for your comments and for taking the time to get in touch – good luck too with your blog, some great articles on there! Hi there and thanks so much for visiting and taking the time to comment, much appreciated. Congratulations too on your blog, re your painting, I particularly liked the reflections in the foreground – hope you keep up the good work! Hey! I really enjoyed reading this post and observing the two paintings and the progress in between each one. The way you can make a painting so great on your first try and then do it again (better) is so impressive to me. As a fellow artist, not so much painting but other media, I admire your work that you’ve done here and hope your future posts are as great as this one! Thanks so much for such kind and generous comments Michael – they really are much appreciated. Unlike you, I’m more limited in my materials – I’m already finding watercolour quite challenging enough so never consider trying anything else! As for the different attempts – I find that I rarely crack it with my first effort, but learn so much from it that I feel compelled to try again (and sometimes again and again and again!) until I feel sufficiently satisfied to move on to another subject. Don’t know if any of this rings true to you in your practice? Haha, yes – can see and appreciate your dilemma there (although I have seen on a brilliant website called ‘Cultpens’ an erasable pen that might be worth checking out? Thanks so much for your kind comments and for taking the time to visit and write – means a lot and is much appreciated! This is more than marvellous. Wow, thanks so much – what a great response – means a lot to me! Thanks Nigel, much appreciated! I still have more disasters than I do successes but will hopefully be able to close that gap with more perseverance! This is an absolute gorgeous piece of art. I wish I had w/colour skills like that! Thanks so much for your kind comments and for taking the time to make them – they really are much appreciated! As for the skills – they’re definitely better than they once were, but still feel I’ve got so much to learn and a lot more practising to do! I’m quite sure you’ll meet that goal. Haha – many thanks for the vote of confidence – I really do appreciate it. It was happenstance that I came across your watercolours. I have been wanting to begin my watercolours for long. Your paintings have inspired me and I will soon begin. John the paintings were fab. Thanks so much – I’m so pleased that you like the paintings and that they may have helped inspire you to pick up a brush! It can be a infuriating and frustrating pursuit – but also a tremendously rewarding one too! Good luck and hope you can visit again. The first thing I noticed was the water, it pulled me in, even before you wrote about it. I even like the one you don’t like so much. I’ve not seen these things before, nor your work…I’m glad I ran across both. thanks for sharing your gifting! Thanks so much for taking the time to comment, I really appreciate it. So glad that you like the water too, I was quite challenged by this so I’m really pleased that it pulled you in – especially as it’s not your typical watercolor subject matter. Thanks too for your kind comments, I really appreciate them! To my mind, the first attempt seems to reflect those terrible times better than the second one. Gray and gloomy colours make me see clearly anxiety in the air. Thanks so much and yes, I can see why the first version might be seen as more evocative – I think I got a bit caught up in everything that I thought was ‘wrong’ with it and couldn’t see what was ‘right’ with it. So pleased that you like this though and I really appreciate you taking the time to visit and comment. So pleased that you like this – thanks so much for taking the time to comment, I really appreciate it! Hi Josephin – thanks so much for re-blogging this post, much appreciated! Thanks so much Alice, so pleased that you like it and thanks for taking the time to comment, it’s much appreciated! Though I don’t paint myself, but I have appreciated good art..it resembles nothing else! Yours was a piece of fine art! Now you’re spoiling me! not sure about it being a piece of ‘fine art’ but I’m so pleased that you like it – especially as it’s not your typical watercolor subject – thanks so much for taking the time to comment, I really appreciate it. Just “Wow” indeed – what a fabulous response – couldn’t wish for a better reaction, thanks so much for looking and taking the time to comment – it’s much appreciated! Good one John, nice to see also a other view from a other artist as well! I did this too before with three painters infault. so nice to see the outcomes! I even made a facebook group based on that. but I decided not to go along with it. so a other friend took over. A watercolor can made in a 1000 different ways, so chose one is always the trick! Thanks Edo – It’s nice working alongside other artists and seeing different approaches to the same subject matter. I think this is one of the aspects that I’m looking forward to when I do my painting course in July. Am hoping that the course will help my find my own ‘voice’. Pleasure David – glad you liked my efforts and thanks again for the inspiration – I much enjoyed recalling my time in Whitstable. amazing…..I could tell that you “connected” with these, it shows in your work. My favorite is the second as well and truthfully I have never heard of the sea forts. They are indeed very strange and little known structures. It’s funny that you thought the paintings showed that I connected with them. I’d not really thought about before but I doubt I’d have tried to portray them the way I did without having a personal experience of them – so yes, you’re right – I think I did connect in some strange and slightly sentimental way. I think so, if anything it is the feeling of how surreal they are. I loved how you depicted the size and the austerity of these structures. Very interesting how we bring as artists a feeling or sentimentality to what we are painting and it showing up, it never amazes me of this fact. Oooh take two feels very watery! I’m always intimidated by trying represent anything wet. And the composition looks much more positive too. Good effort and a nice image choice btw….